If you are in a hurry and need to know about Jimmy Riley’s Live It To Know It, five words – get it, it is essential. I you want the story you can continue. Jimmy Riley – father of acclaimed contemporary reggae singer Tarrus Riley – started his career in the mid-60 as part of rocksteady vocal harmony group The Sensations, an outfit that also included sublime falsetto singer Cornel Campbell. After a while he left that group and formed The Uniques with another renowned falsetto singer – Slim Smith. After several hit singles with The Uniques, including My Conversation, one of the best rocksteady cuts ever recorded, he went solo and started recording with the likes of Lee Perry, Bunny Lee and Sly & Robbie, with whom he recorded easy-skanking solo hits like Love and Devotion and Marvin Gaye’s Sexual Healing, a song that topped reggae charts in 1983. On UK reissue label Pressure Sounds’ 87th release they have focused on Jimmy Riley, but not his most well-known cuts. No, Live It To Know It collects self-produced material recorded approximately between 1975 and 1984. And this is message music. It’s roots music with sparse arrangements and minor chords, and Jimmy Riley sings about immigration, poverty, struggles, equality and justice. Live It To Know It contains 17 songs and is long overdue. 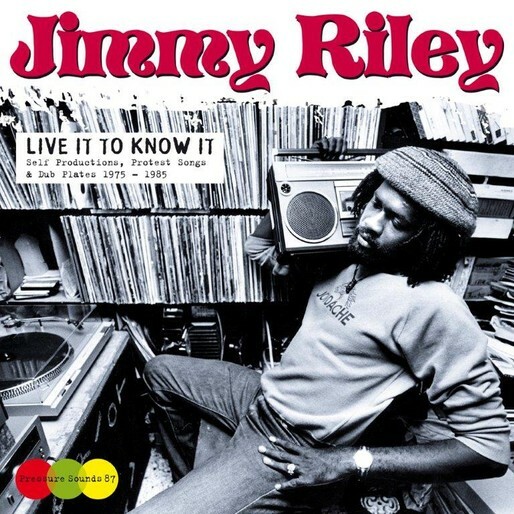 Jimmy Riley is one of many often overlooked Jamaican singers. He has a stellar tenor voice with a bit of grittiness to it. It’s emotive, pleading and heartfelt. He’s a bona-fide soul singer. This album has everything a great reissue should have – excellent music, discomixes, devastating dub versions, good audio quality, scarce material and vivid liner notes. It collects nothing but the best and it captures Jimmy Riley at his finest. jeez, you would have thought that pressure sounds could have come up with a photo of jimmy that hadn’t been used before on a previous album !